. The central server is designed to provide the required network visibility across locations, easily scale, consolidate, and report network health over multiple remote probes. Compare network monitoring options, best suited for your organization requirements from here. The central server dashboard provides overall network health & performance data across the probes. Get a single inventory across all the remote probes with an option to filter by a probe name. 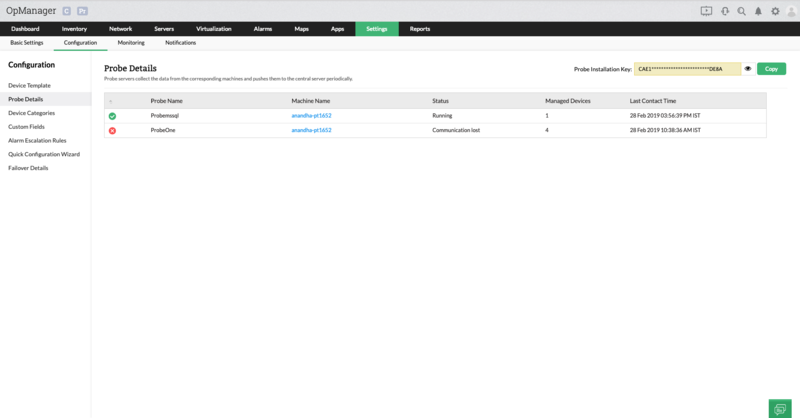 View the list of probes that you have deployed for managing your network. You can now view the snapshot page of a device that belongs to a probe from the central server web client itself. View all the alarms generated across the probes in the central web client for quick fault management. The ability to distribute the network discovery and monitoring load across multiple Probes, helps OpManager scale many interfaces. You can monitor remote networks by deploying the Probes in remote sites. You can also deploy multiple Probes in the same site or even in the same network for scalability. Learn more. The remote Probes are designed to work even behind the firewalls and proxy servers, enabling the administrator to monitor even a wide, geographically distributed networks. The Probe deployed at each site performs all the network–facing tasks such as discovery, mapping, and fault monitoring to report these back to the central server located at the Operating Center/ NOC/ Datacenter. As mentioned above, even a connectivity loss between central and probe server will not lead to any data loss. The data gets stored locally in the probe database and is sent to the central server as soon as the connectivity is restored. This distributed architecture therefore ensures 100% data integrity. Learn more. Uninterrupted enterprise network monitoring is possible with a good disaster recovery plan that factors in system outage and also an entire site outage (triggered either by a natural calamity or human error). A hot standby for both the Central and Probe ensures you enjoy high availability of your network monitoring software. 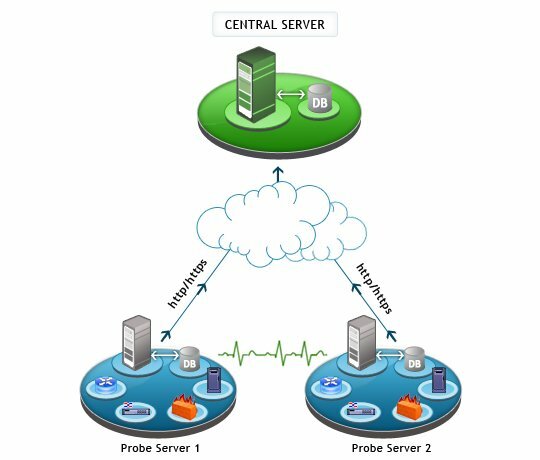 You need not worry even in the event of a connectivity loss between the Probe and the Central Server because the Probe persists the collected data in a local database and pushes a copy to the central server as soon as the connectivity is restored.